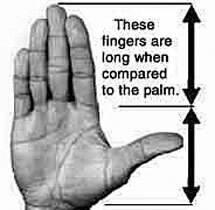 Palm reading long fingers. What long fingers reveal. Your long fingers are seeking more contact with the outer world; from all others around you, and from active people with interesting ideas. You long-fingered people love details, are outer-directed in taking action, and need more data than short-fingered people before forming your opinions or making even the smallest of decisions. You long-fingered people are interested in the details of stories and events. You like to mentally take ideas and things apart, and put them back together again to better understand them before taking action. This drives short-fingered people "crazy". Since there are more long-fingered women than men, that may explain a lot! Choose friends and a mate with fingers long and straight. Your long-fingered friends and mate will understand you much better than short-fingered people. Interesting discussions, planning, and analysis of actions and ideas are delightfully discussed between long-fingered people. Maybe some competition will develop and stimulate some action instead of just doing all talking and thinking. Life with a mate whose long fingers are similar in length to yours will provide many hours of interesting discussions for you both. A short-fingered mate will just be troublesome for you, as she or he will be "marching to a different drummer." Caution: Since thinking and discussing ideas and plans are so enjoyable for long-fingered people, they may delay taking action where needed and miss out on many opportunities in life! Long-fingered people should make sure they get started on their plans and just don't go over and over them in their head endlessly without doing anything about them. People who normally hold and display their hands relaxed with open fingers that are not rigid, feel safe and secure in the present setting. You long-fingered people with open fingers are free spirited with a "live and let live" attitude. You are not ruled by conventional rules of society. You are tolerant of other people's opinions and views, but you do not let them influence you. You listen to the opinions of others but feel free to chart your own course in life based on your own unique views. When the fingers are held tightly together, with the palm open and flat, it is a sign that the person feels unsafe and not receptive to new ideas. The fingers need to be "closed" in order for the person to feel safe and secure. If the fingers are stiff, it shows this person to be very resistive to any changes to present state of mind. It is important for the Hand Analyst not to take this resistance personally or judge the person, for they live in a scary world to them. Much of their daily physical and mental energy is spent just surviving and avoiding potential conflicts. Long stiff fingers are very opposed to any changes in daily routine.